ÖHLINS Road & Track improves the performance and comfort of your car. More than 30 years of racing tradition at the highest level. Outstanding precision in the development and manufacture of the world’s most advanced shock absorber technology. From now on, available for everyday road vehicles. The goal of our development was clear right from the beginning: Outstanding driving characteristics on asphalt, combined with maximum comfort for everyday use. The time of compromise is over! In addition, there is a well-thought-out, mostly based on the material aluminum, lightweight construction of our developments. Just as important to us is the durability. That’s why the passed ISO 9227 salt spray test is just one of many technical tests that express our understanding of quality as well as the limited 2 year warranty on all our products. Have we piqued your interest? Then use our online shop, select the desired set and order today. A technology with which ÖHLINS is one step ahead of its competitors. Only ÖHLINS uses the DFV technology for its products in the automotive sector. In DFV technology, the double-flow valve ensures that damping is the same dynamic during compression as during rebound, as the damper fluid travels the same flow path in both directions. This means that the wheel and tire can quickly return to their optimal position on the ground, providing better grip and traction. ÖHLINS equips its new Road & Track range with DFV technology, creating the perfect retrofit option for the ambitious rider looking for comfort and agility in one component. As the DFV opens faster and easier on rough roads, the ride comfort is amazingly sophisticated and comparable with an OEM strut rather than a coilover configuration. On uneven ground, the compliance of the Road & Track elements ensures that the car retains its grip when driving over bumps and potholes, making it stable and manageable. DFV ensures optimal traction. Why should you settle for less when it comes to the chassis? 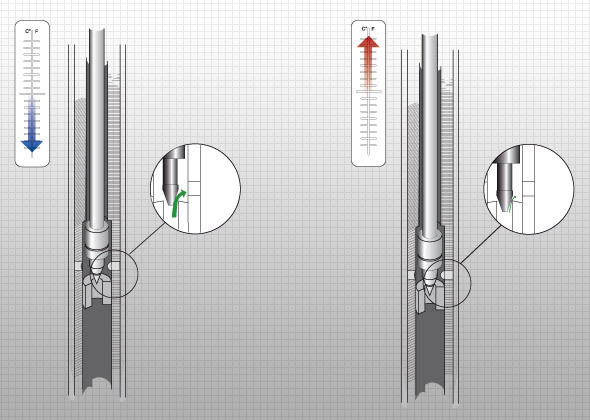 At low piston or compression speed of the majority of the oil flows through a hole in the needle valve (bottom, dotted arrow). At higher piston or compression speeds, the majority of the oil takes the path via the compression valve (upper, dotted arrow). At extremely high piston or compression speeds, such as sudden impacts on the chassis, the oil can also escape via the pressure valve of the double-flow valve and thereby increase ride comfort. At low piston or compression speed of the majority of the oil flows through a hole in the needle valve (bottom, dotted arrow). 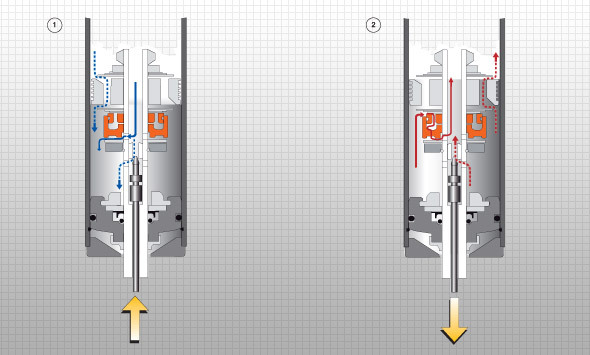 At higher piston or compression speeds, the majority of the oil takes over the rebound valve (upper dotted arrow). At extremely high piston or compression speeds, such as sudden impacts on the chassis, the oil can also additionally dodge over the rebound valve of the double-flow valve, thereby ensuring the ground contact of the tires. Without a double flow valve, a shock absorber can not respond quickly enough to a sudden shock. When rebounding the vehicle thereby loses contact with the road. The double-flow valve allows the oil to flow in both directions at lightning speed. The shock absorber piston immediately changes from compression to rebound in a sudden impact, leaving the wheel in contact with the road. When adjusting the suspension level of coilover components, it is worth comparing how this is technically implemented. In many inferior constructions, the suspension level is simply adjusted by means of the lower spring plate. As a result, the spring is compressed or stretched, which can limit the travel and cause the suspension strikes. In the ÖHLINS process, the spring plate remains in the optimum position, while the lower flange on the threaded body can be easily rotated. This allows you to perform the adjustment with absolute precision without compromising the perfect damping characteristics. When everything is set, the adjuster snaps in so that your setting is maintained exactly. Of course, these kits work “ex works”, but you still have plenty of room to customize them to your personal taste. Do you like it hard and direct? Or rather soft and comfortable? You can choose it. Excessive damping may affect traction. That’s why the easy-to-adjust phaser on the underside of the ÖHLINS components makes it possible to fine-tune each individual parameter. The Road & Track McPherson struts also have adjustable camber top and bottom mountings to give you the ability to fine-tune your wheels for the occasion – whether you’re going for a ride or your car at the weekend want to turn a few laps on the racetrack.